MST’s moving billboards are a great way to reach the approximately 425,000 residents of Monterey County. MST also serves select locations in Santa Cruz County, Santa Clara county and San Luis Obispo County. In addition to this year-round population, there is an estimated eight million annual visitors to our beautiful Central Coast. This is your audience when you choose to advertise on MST’s bus fleet. In addition to these impressive numbers is the wide demographic profile of the County. Your business is exposed to the entire range of the population. 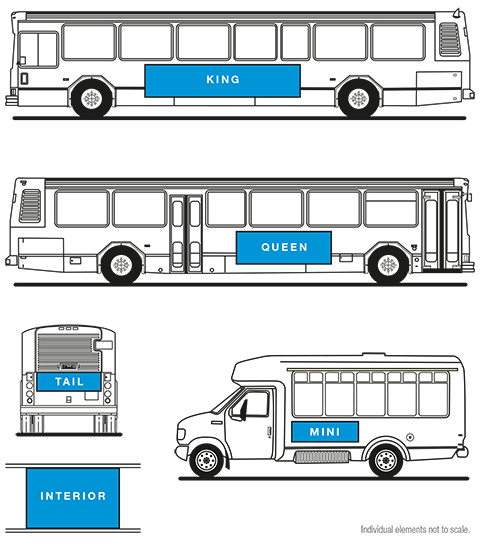 MST’s fleet of 111 buses travel over four million miles each year in a 280-square-mile area. This enables your message high visibility while moving around the market like no other advertising venue. • Interested in on-board advertising with an interior card? MST’s annual ridership is 4.5 million passenger trips – or more than 14,000 riders each weekday. To reserve advertising space or confirm space availability, call Chris Chidlaw of Chidlaw Marketing at (831) 641-0657. Rates are per ad, per month net. Production and mounting costs include labor and materials, and will be quoted at the time of contract. To reserve advertising space or confirm space availability, call Chris Chidlaw of Chidlaw Marketing at (831) 641-0657. Car Cards are 11” Tall x 17” Wide. Rates below are per card. Nonprofit organizations receive two months of advertising for the price of one. Offer restricted to space availability. Advertiser is responsible for design, production and printing of posters. MST will provide mounting in order to simplify shipping and delivery of posters. Exterior posters are to be printed on 4 mil. Flexcon Busmark adhesive-backed vinyl. All ads must be mounted to 5 mm. Coroplast. Ads are to be mounted as one piece. Coroplast must be cut to the exact size of the bus ad frame. All four corners of mounted ad are to be trimmed at a 45° angle. Ad frame dimensions can be found above next to the rates. Live areas should be no closer than 2” from all four borders to allow for frame. Mounted ads must arrive at MST a minimum of three days prior to start of ad campaign. Unmounted ads must arrive at MST a minimum of 14 days prior to start of campaign. Drop ship location for printing and/or mounting is available on request. Do not ship unmounted ads to MST. Mounted ads may be shipped directly to MST at: 19 Upper Ragsdale Drive, Suite 200, Monterey, CA 93940. A deposit equal to one month’s payment is due in advance to reserve space. Succeeding months are billed at the beginning of each contract month and are payable upon receipt. The deposit will be held until the end of the contract term and will be applied to the final month of the contract. Non-payment will result in immediate removal of signs and cancellation of contract. Posters become the property of MST. Used posters are disposed of after their contract has expired and will not be returned to clients or designers/artists nor will they be stored by MST. New vinyl posters are required to resume advertising following any break between advertising periods. MST does not accept political, religious or sexually explicit advertising, nor does MST accept alcohol or tobacco messages. All advertising must comply with MST’s advertising policy.